The opening of the latest album from Today is the Day is the pulling back of a trigger, and if that's not a precursor for what's to follow, then nothing is. 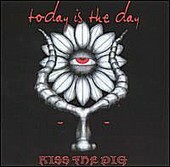 Explosive, seething, and abrasively violent, the 11 tracks comprising Kiss the Pig are venomous bursts of unresolved anger contemptuously spewing through your speakers. Abandoning its slower, more grinding approach for a faster, heavier, and more chaotic sound, Today is the Day have once again put its definitive stamp on the extreme metal genre by adding yet another type of musical terror to its already foreboding arsenal. Pushing the limits and boundaries yet again, Steve Austin and crew have done their job by striking a nerve in the metal genre's conscience.